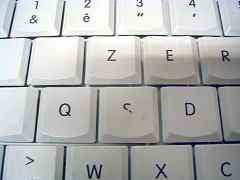 The operation here consists in reattaching a key was has been ripped off by accident. 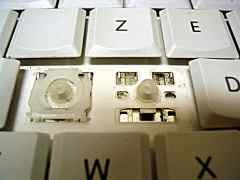 Fortunately, in this case, the mechanism under the key has not been damaged. 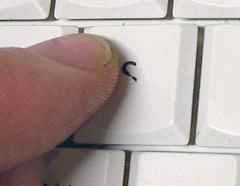 The "Q" key has been removed, as for the "S" one, but here we also removed the mechanism under. The different components. On the first piece, on the extreme left, we can see 4 lugs on the 4 corners. On the piece in the middle, 2 lugs which act as pivots. Last but not least, the ripped off key (rear view): two glides and two clamps in its upper part. The two mechanims pieces reassembled. 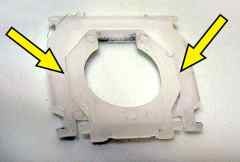 In the aperture, on the right, one can see a slot which will receive the protuberant part we can see on the left. Be carefull no to put one of them in a wrong position! If they are well assembled, the mechanism can well be down flat on the table. The two arrows point to the area where will be clamped the lugs of the inferior part. 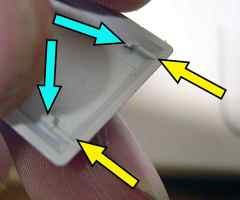 Do not force on each lug but, instead, slightly press the whole piece within your fingers to slide them in the aperture. Then release the pressure with the lugs face the clamping holes. Now we put the mechanism back in place. 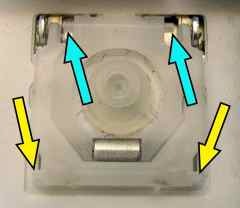 First, slide the nick under the yellow arrow while introducing the piece in the direction it can open without restriction. 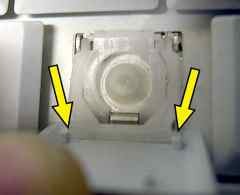 Then, the lugs pointed by the blue arrows have to be slided to get the final result, as the one pointed by the white arrow on the left undamaged key's mechanism. First, we put the lugs (yellow arrows) in the key's glides. Then we can clamp the upper part of the key onto the lugs pointed by the blue arrows. The glides guides (yellow arrows) and the stops (blue arrows) in which the lugs will shim. First shim the lugs to the end of the glides guides (yellow arrows). Then, close down the key and lock it on the left and on the right.